Collaboration between health-care professionals is essential for effective patient-focused care. An emphasis on bringing together social workers, physicians, pharmacists, nurses, paramedics, optometrists and other emergency response and health-care specialists begins when these professionals are still in training. 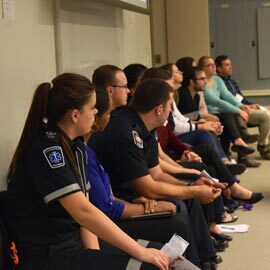 Students from Wilfrid Laurier University, Conestoga College, McMaster University, Renison University College and the University of Waterloo recently participated in the Interprofessional Educators Collaborative of Waterloo-Wellington (IPEC) Sixth Interprofessional Case Showcase. “It is so important for social work students to understand the fundamentals of how to work together with other health care professionals for the benefit of their clients,” said Eliana Suarez, assistant professor in Laurier’s Lyle S. Hallman Faculty of Social Work and IPEC organizer. Students from each institution formed two interprofessional teams, which were tasked with creating and presenting a care plan for a patient case. Students on the teams benefited from understanding each other’s role, and just as in the real world of health care, teams were required to develop a comprehensive presentation in a limited time frame. The teams presented and fielded questions from the audience, also taking a moment to share some of the lessons learned from their experience cooperating to deliver a care plan. Both teams described how they developed further respect and appreciation for each other over the course of the evening. Interprofessional education (IPE) is a foundational element of health-care training throughout the Waterloo-Wellington Region. Laurier’s Faculty of Social Work students participate in IPE throughout their training as part of learning about contemporary social work practice. The Faculty of Social Work, one of the leading social work schools in Canada, combines innovative teaching and research techniques with work integrated in the community.